New York has its Wall Street titans and its media elite. LA traffics in good looks and charisma. Seattle is a different matter altogether. Here the juice that puts things in motion is harder to define. The closest word is ideas. But it’s never the idea siloed in the head of one person. It’s the big idea, wet and ill formed, that leaks from one mind to another, the idea upon which entire communities feast before rising onto the national stage. This January, hundreds of people attended the grand opening of an addition to the Teton County Library in Jackson Hole, WY. 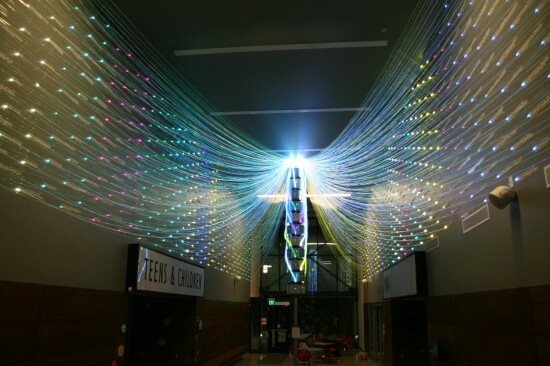 The big draw was “Filament Mind,” a stunning digital art installation utilizing more than five miles of fiber-optic cables, cut into 1,000 pieces, and 44 LED illuminators. If you’re a Seattle arts and culture lover, you owe a lot to a man named Bagley Wright. The Space Needle, Benaroya Hall, Seattle Repertory Theater — Wright helped build or create all of them. Then there’s the art he’s given to the city. Ever since Northwest Book-fest hacked up a Target-branded lung and died back in 2004, hundreds of people have tried to bring a book festival back to Seattle. One notable attempt to revive the literary festival at the Columbia City Event Center in 2009 was ill-conceived and awkwardly produced, costing local booksellers and publishers a lot of money for little return.